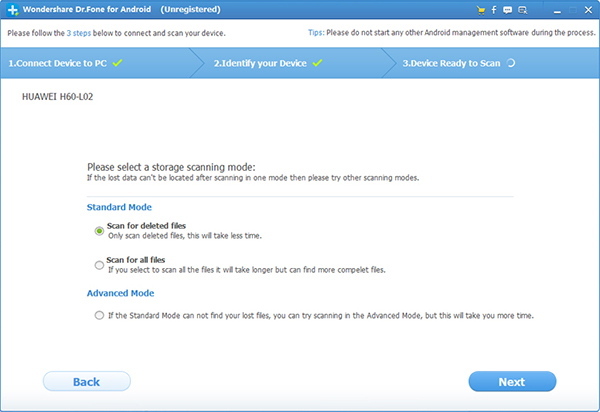 Recover lost data from Android devices including Samsung, HTC and more. Android data recovery is specially designed for quickly and easily recovering deleted or lost data including contact, message, video, audio, WhatsApp, call history, photo, and document from various hot Android devices. 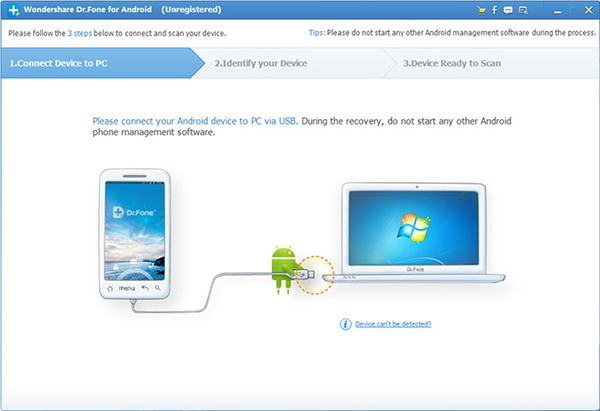 Launch Android data recovery and connect your Android device to computer via a USB cable. 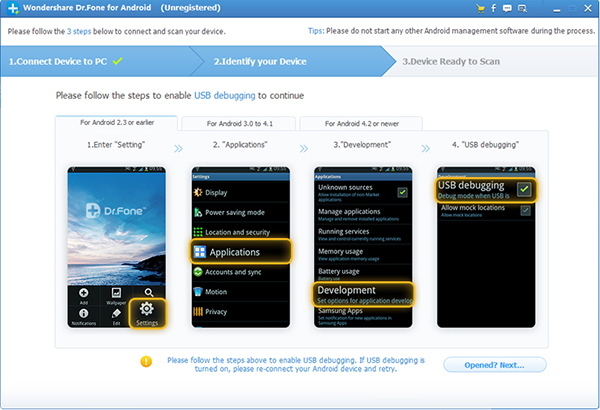 Android data recovery will prompt you to enable USB debugging on your phone. Thus, your Android device can be recognized automatically. Then, please click "Next" in next interface. 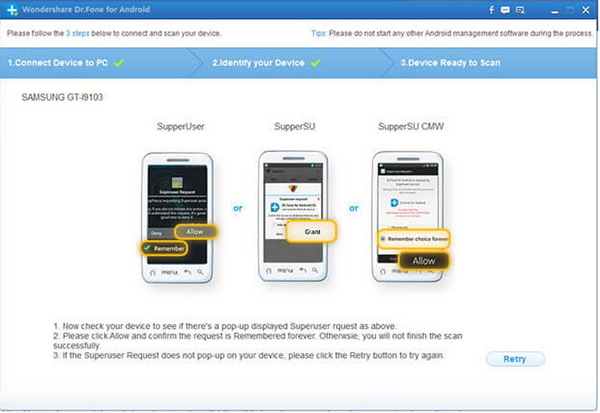 If your Android phone is rooted, please click "Allow" when the message pops up to let the program SuperUser run. Note: Please make sure the battery of your device should be at least 20% to finish the work properly. 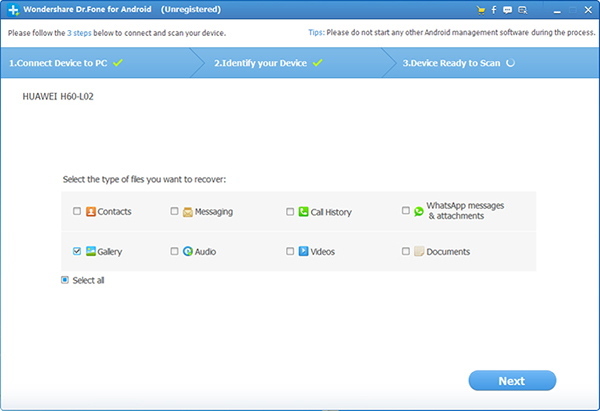 If you are aimed at recovering the one of the lost files, Android data recovery allows you to select the file types first before scanning for saving your valuable time; or you can also select all file types. Then a newly interface will display you two kinds of scanning modes (Standard Mode and Advanced Mode). You can choose either of them for precise scan. Note: Advanced mode is able to search lost data more deeply but normally costs more time. After scanning is done, a new interface will show the scanned results. You may preview them in advance before recovering to ensure the right data to be recovered. Then you can directly Click "Recover". But if you select all file types when you did in step3, the results then will be stated in well-organized categories according to its belongings. Therefore, you are allowed to preview data according to types, confirming what kinds of files are needed to be recovered. What's more, you can click "Only display the deleted" for recovering deleted files expediently. Last, once you click the "Recovery", a pop-up window will display to let you choose storage path in your computer.